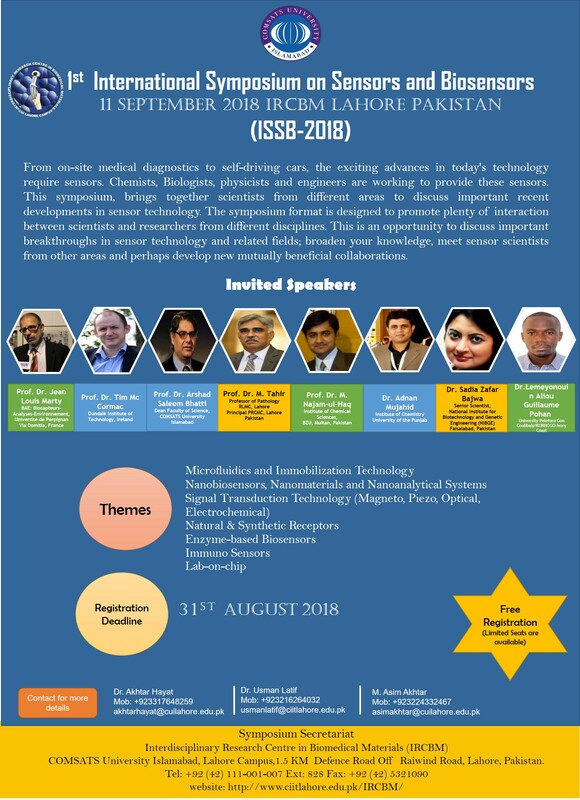 6 th International Symposium on Biomedical Materials (14-16 December, 2017). HEC-NRPU awarded to Dr. Usman Latif for the project titled "NOVEL ELECTROSPUN NANOFIBERS FOR POINT­OF­CARE PATHOGEN DETECTION - DENGUE VIRUS SENSOR", worth 3.5 million PKR. HEC-NRPU awarded to Dr. Usman Latif for the project titled "A SENSOR ARRAY TO DIAGNOSE ALL ­CAUSE MORTALITY BIOMARKERS -­ DEATH RISK ASSESSMENT", worth 6.8 million PKR. HEC-NRPU awarded to Dr. Abdur Rahim for the project titled "SMART NITRITE SENSOR FOR REAL­TIME FOOD AND WATER QUALITY MONITORING â€“ IMPROVING PUBLIC HEALTH", worth 4.5 million PKR. Dr. Qasim, King Faisal University Saudi Arabia presented his research work, titled "Molecular Characterization of Entosis” at IRCBM. 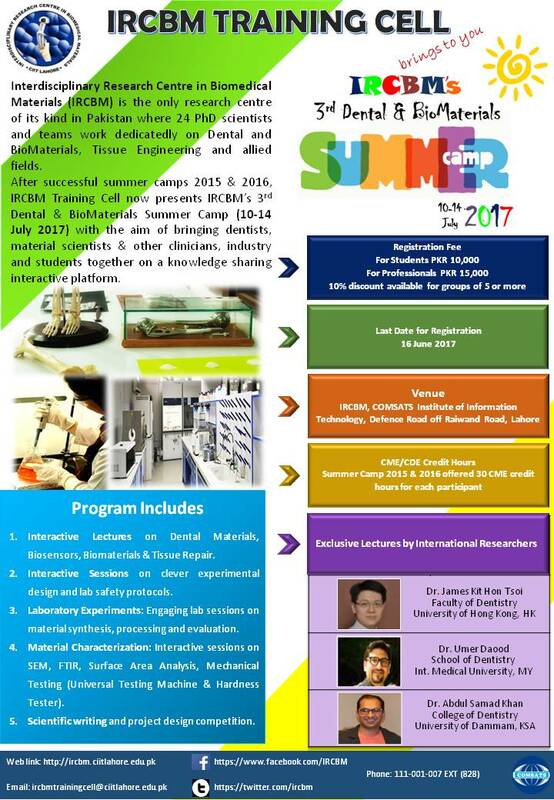 3rd Dental and Biomaterials Summer Camp, 2017 successfully conducted by IRCBM. Prof. Dr. Qaisar Abbas, Director CUI Lahore Campus graced the closing ceremony with his presence as Chief Guest, held at IRCBM. Prof. Dr. Qaisar Abbas, Director CUI Lahore Campus presided a meeting with the faculty of IRCBM. Prof. Ihtesham-ur-Rehman, Executive Director IRCBM and Dr. Aqif Anwar, Head IRCBM were also present. Prof. Qaisar praised the overall performance and discipline of IRCBM's faculty. Jul 14, 2016: Prof. Khalid Almas (University of Dammam, KSA) to present at IRCBM on the topic "Guided Tissue Generation in Periodontal Practice" as a part of UHS-PADR dental Event 2016"
Dec 15, 2015: IRCBM recieves Pakistan's first low load electrohydraulic fatigue tester.